no more arm squeezing either by the evil cuff machine. 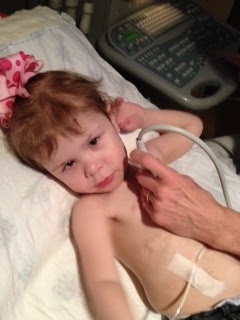 When Annabelle first came home from the hospital, we went to cardiac clinic 2x per week, sometimes more. This is a FULL clinic including labs, EKG, blood pressure, and echo. We then went to weekly (FINALLY) and then every other week and then mid-last year we went to once per month, and then end of last year finally once every other month. And during this time she had labs taken each visit and once in between, so we’ve been on monthly labs all year, which REALLY stinks. We hit a NEW milestone today though! 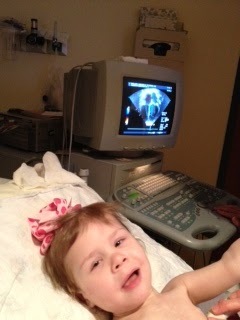 She got a THUMBS UP at her visit…. and now does not have to return for THREE WHOLE MONTHS!!!!! AND!!! Labs are now every SIX weeks instead of every FOUR. Can I get a Hallelujah in here??? I know I can get one from Annabelle! 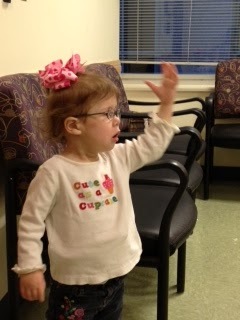 Yeah… I can look cute during an Echo! 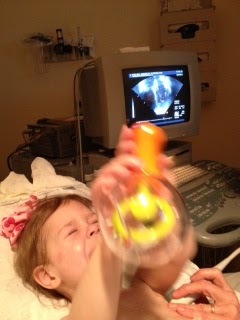 Today, she was calmly standing in the vitals room and the “blood” lady walked in. Annabelle turned around, and I can’t describe accurately enough the extreme scream that could be heard throughout the entire clinic. It was seriously like she’d seen a monster or something and was just petrified. Half of me laughed because I have NEVER seen my girl so adamant, and the other half was hurting for my sweet baby who was so terrified. If you think I’m awful for laughing… you have to realize that I’ve seen this sweet one pricked, prodded in every way possible since the day she was born. Blood taking (and her hatred there-of) is, unfortunately, not a new thing, so I’m a bit used to it. To a point, I’ve had to harden myself to it in order to cope with seeing this myself. But her terror today was a whole new level. I think she’s just remembering a lot more. I’m hoping in the next year she’ll get to the point of realizing that if she just sits and gets it over with, it’ll be easier. They tell me that usually that happens between 3 and 4 with these kids that have labs taken so often. Mommy hopes so! The only little concern we have is that her lungs had some course breath sounds in them today, May be following up with pulmonology to check it out. The girl,, the boy, the pig, the cow, and the zombie. And for Lacy, softball season is in FULL swing. This is her first year doing fast pitch, so she’s learning a lot of new stuff and is super excited about it. Gabby is as sweet as ever. She’s a girl after her Momma’s heart. They had a “read-a-thon” week for school last week. She took it VERY seriously and would come to me and show me her 15 books she’d read and logged for the day. Yup. She’s gonna be my reader, just like her momma! Oh, and of course, hubby is doing well. Working ALL the time, which is a bit BOO, but also YEAH because the job he started in January is going really well. We have HEALTH INSURANCE again, can I get another Hallelujah??? I can finally replace my poor glasses that are scratched to the point that… you know when your computer screen is super smudged and you’re like, what in the world is that… or you start seeing periods in odd places where there are none? Yeah, that’s what my world has been like. So YEAH for insurance! We are still doing a lot of praying about our future, and asking God for wisdom in some pretty big decisions we’re facing. Your prayer for us during this time is appreciated! Well, that is our update. Pray you all have a HAPPY Monday! Anyone have any prayer requests or any HAPPY news to share of your own? I’d LOVE LOVE LOVE to hear it! Way to GO Annabelle! You keep rocking this good news!! You got it "Hallelujah" …a millions time over !! Yay Annabelle and a big yay for Mommy too, as always!! AWESOME clinic news! Praise the Lord!!! Also, VERY BIG YYYAAAAYYYYY for health insurance! I could use some prayer for my Internet Service Provider to fix my connection speed issue. It's been going on for MONTHS and they can't seem to figure it out. Thank you very much! I should have explained that my home job depends on my internet connectivity. I'm single and have my parents living with me, so it's not a trivial issue. Love the Minecraft! My men play it daily so no perplexed looks here. I'll pray for your parents, your niece and nephew and the rest of your family as you deal with this very difficult time. So pleased to hear the good news about Annabelle. I remember the days when Daniel started crying as soon as we pulled into the parking lot of the doctor's office. Thankfully, that is just a memory at this time instead of a reality. I know Annabelle will come to brave it, too. My boys will love seeing the Mine Craft picture. They really love Mine Craft.